In early September 2016, a new advertisement appeared on various Darknet platforms, promoting a new hidden service. The service, dubbed Open Hacking Lab (OHL), offers three categories of products: hacking tools and resources, hacked credentials and services. While numerous hidden services on the Darknet sell hacked credentials, this is the first time we have observed the sale of administrator credentials for Office 365 accounts. Microsoft Office 365 is a software package that includes cloud services, sold to corporates and private customers. The organizational package includes email, storage, social network, SharePoint and other services provided via cloud. Acquiring administrator’s access to organization that use Office 365 will provide a potential attacker with access to sensitive organizational information and may even lead to the threat actor gaining full control over the organization network. Currently, 12 accounts are being offered for sale, with prices ranging from $15 for a logistics company account to $100 for a law firm. For each company, the seller provides a short description of the company, its country of origin, and which data the buyer will gain access to. Eight of these companies are based in the U.S., two in Europe and two in Canada. The operator of the hidden service is a well-known actor in several communities on the Darknet; he is considered credible and he possesses high technical skills. The hidden service owner also runs a Twitter account dedicated to the service, where he updates about the platform and its products. During May 2016, we witnessed the second phase of the #OpIcarus cyber campaign against banks around the world, launched by the Anonymous collective in February 2016. The participants carried out DDoS attacks against bank websites in various countries on a daily basis. Several cyber-attacks succeeded in shutting down the websites of central banks in Greece, Cyprus and other countries. The initiators created two Facebook event pages and opened an IRC channel to coordinate their cyber-attacks. Approximately 2,000 participants joined the #OpIcarus event pages, but many more hacktivists expressed their support of this campaign via their social media accounts. With regard to the dedicated IRC channel, it appears not to have been as active as the campaign platforms in Facebook and Twitter. According to news reports, #OpIcarus participants shut down bank websites around the world on a daily basis. We cannot confirm that all of the mentioned banks websites were actually offline, due to the participant DDoS attacks, but we wish to point out several incidents that caught our attention. A member of the Ghost Squad Hackers group dubbed s1ege took responsibly for shutting down the email server of the Bank of England. The bank did respond to this attack, but according to news reports, the bank’s mail server was offline on May 13, 2016. In addition, according to a single news report shared on various Facebook accounts, Chase Bank ATMs stopped working on May 14, 2016, as a result of the Anonymous collective cyber activity. The Twitter account of Chase Bank’s technical support tweeted that their ATMs did not accept any deposits on this day, but they did not mention what had caused the problem. 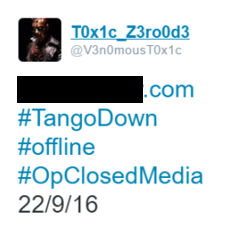 Meanwhile, the Ghost Squad Hackers group tweeted that the incident was part of the #OpIcarus campaign. Additionally, s1ege claimed on May 18, 2016, that they had shut down a website related to the NYSE. The NYSE Twitter account tweeted that they had experienced a technical issue in one of their trading units. They did not mention what had caused the problem. Therefore, it is unclear if there is any connection to the Ghost Squad Hackers group, aside from the latter’s claim of responsibility. 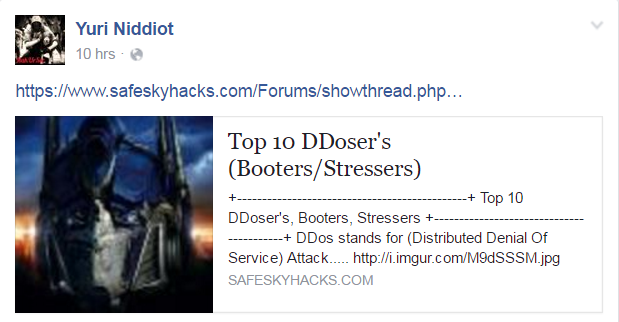 With regard to the attack tools, the participants used a variety of DDoS, some of which were simple online tools with no sophisticated DDoS abilities. However, there were indications that they used DDoS-as-a-Service (DaaS) platforms, such as Booters/Stressers that require payment and registration. In addition, the New World Hackers (NWH) team that took responsibility for shutting down the HSBC Bank website on January 29, 2016, supported the #OpIcarus campaign.